Dimmable LED downlights are available with either a GU24 base or an E26 screw-in base. 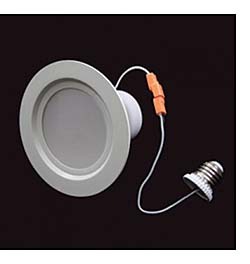 Downlights use either 11 or 19 watts and have a CRI of 85 and a warm-white color temperature of 2700K. Lumen outputs are 720 (11 watts) and 1,450 (19 watts). Lamps can replace either 50- or 75-watt incandescents and can be installed directly into standard flush-mounted 4- and 6-inch cans. Beam angle of 120 degrees. Input voltage is 120 VAC at 60 Hz.